Samir Nasri and Pablo Zabaleta fired Manchester City past Roma, and through to the Champions League knockout stages after a hard-earned 0-2 victory in Italy. City were in need of a win or else the Manchester-based club would leave Italy waving goodbye to Champions League transcendence. Roma tumbled towards City early on, and passed, moved around the centre well which lead to the hosts earning a corner. The delivering was a dangerous one, but was wasted as the ball smashed into the side netting and out. Positive start for Roma, though. Ljajic scampered down the right channel, checked back and launched an ambitious ball over to Holebas who quite brilliantly scorched into the area, through the City defence and one on one with Hart. The England keeper smothered Holebas' lackluster attempt and the ball pounded away. Pellegrini's men still failed to clear the danger. Nainggolon blistered down the left, and slid a pass through to Gervinho but Mangala, lucky for the hosts, hacked clear. Clichy drifted into space, provided by Nasri. The French left back swung a decent cross into the box which was headed by Dzeko, however his attempt never posed a threat for De Sanctis. Roma ambitiously broke forward on the counter, looking to snap City's defence. Gervinho twisted and turned, cut in, out on the right until firing a low drive into the bottom left side that Hart flicked around the post. Terrific stop by the English goalkeeper, who would then comfortably see to the corner. Half an hour in, and City began to grind Pellegrini's philosophy into the game and announce their intentions of haulting Roma. Hart proved why he is Hodgson's first choice national keeper, denying the hosts on several occasions. Holebas attempted to change that, as he won a corner. Pjanic swung the ball centrally, but it was confidently punched away by Hart who had been terrific when challenged. Roma would almost strike on the 40 minute mark. Totti lofted a sweet ball over to Gervinho who used his acceleration to perfection, but his shot was slightly scuffed which enabled Hart to deal with the danger. Literally a few seconds later, City almost pounced no the hosts' missed opportunity. Navas clipped a fabulous ball over to Milner on the right who made the keeper work with his effort. Nothing resulted in the corner afterwards, however. The visitors made a good start top the second half, stringing passes together and manoeuvring around the field well. Clichy lifted a ball over to Dzeko but the City-man was unable to convert. The Italian-based side responded well, and nearly grabbed a sneaky goal. Pjanic scorched down the flank and unleashed a thunderous strike from long range. A chest-clobber for Hart to deal with it, but he managed it. Samir Nasri soon put the hosts ahead with a phenomenal strike. The Frenchman held play up, looking to slide a ball through but no City player appeared. Unmarked, he took a couple of strides just outside the area and thumped a pelter at goal. The ball clattered off the post from the left to the ring, it was that powerful. Absolutely fantastic. Ljajic twisted and turned down the left, baffling Zabaleta to a halt. The Roma-man scampered through the defence but frustratingly for him, blootered his effort well over the bar. The hosts began to put City under pressure, as they created two goal-scoring chances. The first, Manolas galloped above Mangala but his attempted header form the free-kick smacks off Hart's left post and out for a corner. Very close. From the resulting corner, Destro retrieved possession inside the area and whacked a ruthless strike at goal, only to be thwarted by Demichelis on the goal line. He claimed a use of hand, but the referee shrugged off the appeal directed at Argentina's centre back. Roma piled forward, with just 10 minutes remaining, searching for a vital equaliser. Gervinho headed a looper towards Hart, but the former Arsenal man found himself unlucky as England's keeper thwarted him with a finger. If you wasn't quite convinced it was over Zabaleta confirmed it was. The Argentine romped on an over-lap where Nasri showed his class and slid a pass through to him, where the City-man would fire home in the centre. Classy performance by City. 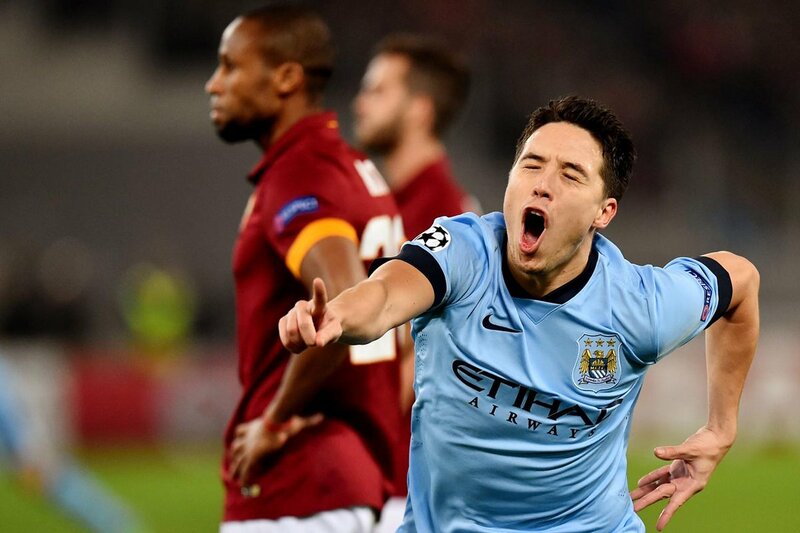 A match report for Roma vs. Manchester City in the Champions League, contested on Wednesday 10 December 2014.